Tembleques are beaded flowers that make up the headdress of La Pollera, the national costume of Panama. 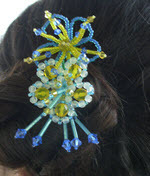 These techniques may look like the basic French beaded flower or loop techniques but they're quite different. You'll also recognize the Victorian technique with some interesting variations. The tutorial is 29 pages with detailed photos showing each step. Five petal techniques with variations are shown as well as how to assemble a hair ornament. 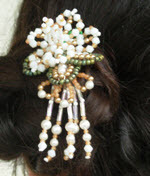 These hair ornaments are very light and would be great for brides.